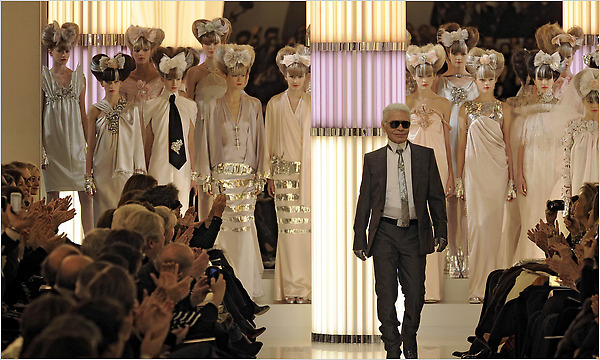 Karl Lagerfeld said the inspiration for Chanel’s spring 2010 couture collection came to him in a dream. PARIS — Like a box of macaroons projected into cyberspace, the Chanel show on Tuesday played soft and citrus pastels against streamlined silver to make a strangely beautiful show. 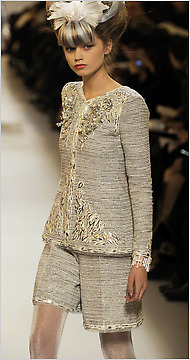 (L) The traditional Chanel suit looked fine with culottes but ungainly when the model was in motion. (R) The moon, la luna, prompted Giorgio Armani to use rounded silhouettes and ethereal colors for his Armani Prive collection. “Neon baroque” was Karl Lagerfeld’s pithy take on the contrast that his pallid palette and frothy surfaces had with the pillars of neon strip lights around the set. There was something that was not quite in harmony, especially with the daytime clothes. The famous Chanel suit, edged with silver and shown with culottes trimmed in tulle, looked fine standing still, but too much like ungainly shorts in motion. Simple dresses with the bouffant hair gave a weird flashback to the 1960s. The collection worked best in its gossamer evening loveliness and in its details, from the neon-light necklaces to silver boots with curved heels to the chrome half-gloves — a fetish of Mr. Lagerfeld himself. For a designer who is recognized for his pony tail, he gave the models extraordinary hair, each side as full as an 18th century wig, with a bow nesting at the front. Like Chanel’s all-white collection of a year ago, Mr. Lagerfeld said the vision of silver flashing across watery colors had come to him in a dream. Not a single black dress, Coco Chanel’s classic invention, walked the runway, although a bold black necktie, its ends dangling as loose ribbons over a slim white dress, had Mr. Lagerfeld’s graphic spirit. Mostly the designer suppressed his skill as a fashion architect and turned decorator. The ornament was extraordinary, yet it was a column of a dress suspended from a silvered shoulder line, rather than the fragile multi-embellished dresses that marked the collection. 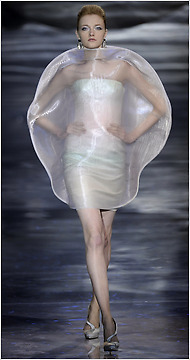 And even to someone arriving from the moon, the show immediately was recognizable as haute couture. Giorgio Armani’s theme was la luna — the moon. It curved like a newborn on the backdrop, shone its eerie silvered light on fabrics, wrapped its half-roundness at hips and waists and glowed over all the accessories at the Armani Privé collection. “Why the moon? Because it is romantic,” the designer said backstage, after he had opened the collection with a compass twirl at the side of a suit skirt, the lightly quilted jacket often closed with a pin in the shape of a new moon. Keeping the colors to pre-dawn streaks, Mr. Armani used a palette of palest pink, icy blue and a silvered ivory, with the starry surface of a night sky twinkling from the lamé of a midnight blue gown. The vision was almost too graphic — as though a compass, rather than a flexible human hand, had drawn a jacket collar, a circular cape jacket or an un-furling dress. There were faint echoes of Pierre Cardin’s early experiments of half a century ago, not least because the Privé collection included hyper-modern fabrics. But Mr. Armani was true to his own vision and the success he has made of this upper-end Privé line, introduced in 2005, was evident in the audience — not just the stars like Anne Hathaway and Tina Turner but in the ranks of clients. Each single piece, extracted from the moon river curling down the runway, was less obviously part of a theme and more a useful and wearable item. True to his aesthetic, the designer showed trousers, which are so rare on couture runways, teaming them perhaps with a shapely peplum jacket. The slender evening dresses with their gleaming surfaces seemed a little other worldly, but perfect for the red carpet and for getting across a message of shimmering glamour and of high-end clothes that are the lunar opposite of the multitude of practical, sporty Armani lines. This entry was posted in Fashion and tagged Anne Hathaway, Armani Prive, Chanel, Coco Chanel, Giorgio Armani, Karl Lagerfeld, Tina Turner on January 27, 2010 by fauxionista.